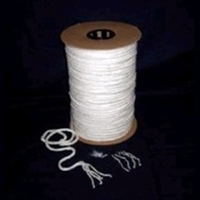 A 1/4" 4 ply 100% cotton rope that is: "Simply Unfooled Around With"!It is 100% natural and unbleached.It is everything cotton rope shouldn't be - which is why it is being manufactured exclusively for bird toys. It is short fibered and, therefore, pulls apart easily, which will minimize the risk of entanglement. If you pull on the fibers from the ends or shafts, you will get cotton puffs instead of long threads. Great for making your own toys and giving your Birds hours of playtime fun. This is the best rope I have used so far. I feel safer knowing that my birds won't get tangled in "strings". I always use short pieces and the birds absolutely love shredding it apart! !